This is the last of four conversation Gudrun had during the British Applied Mathematics Colloquium which took place 5th – 8th April 2016 in Oxford. Andrea Bertozzi from the University of California in Los Angeles (UCLA) held a public lecture on The Mathematics of Crime. She has been Professor of Mathematics at UCLA since 2003 and Betsy Wood Knapp Chair for Innovation and Creativity (since 2012). From 1995-2004 she worked mostly at Duke University first as Associate Professor of Mathematics and then as Professor of Mathematics and Physics. As an undergraduate at Princeton University she studied physics and astronomy alongside her major in mathematics and went through a Princeton PhD-program. For her thesis she worked in applied analysis and studied fluid flow. As postdoc she worked with Peter Constantin at the University of Chicago (1991-1995) on global regularity for vortex patches. But even more importantly, this was the moment when she found research problems that needed knowledge about PDEs and flow but in addition both numerical analysis and scientific computing. She found out that she really likes to collaborate with very different specialists. Today hardwork can largely be carried out on a desktop but occasionally clusters or supercomputers are necessary. The initial request to work on Mathematics in crime came from a colleague, the social scientist Jeffrey Brantingham. He works in Anthropology at UCLA and had well established contacts with the police in LA. He was looking for mathematical input on some of his problems and raised that issue with Andrea Bertozzi. Her postdoc George Mohler came up with the idea to adapt an earthquake model after a discussion with Frederic Paik Schoenberg, a world expert in that field working at UCLA. The idea is to model crimes of opportunity as being triggered by crimes that already happend. So the likelihood of new crimes can be predicted as an excitation in space and time like the shock of an earthquake. Of course, here statistical models are necessary which say how the excitement is distributed and decays in space and time. Mathematically this is a self-exciting point process. The traditional Poisson process model has a single parameter and thus, no memory - i.e. no connections to other events can be modelled. The Hawkes process builds on the Poisson process as background noise but adds new events which then are triggering events according to an excitation rate and the exponential decay of excitation over time. This is a memory effect based on actual events (not only on a likelihood) and a three parameter model. It is not too difficult to process field data, fit data to that model and make an extrapolation in time. Meanwhile the results of that idea work really well in the field. Results of field trials both in the UK and US have just been published and there is a commercial product available providing services to the police. In addition to coming up with useful ideas and having an interdisciplinary group of people committed to make them work it was necessery to find funding in order to support students to work on that topic. The first grant came from the National Science Foundation and from this time on the group included George Tita (UC Irvine) a criminology expert in LA-Gangs and Lincoln Chayes as another mathematician in the team. The practical implementation of this crime prevention method for the police is as follows: Before the policemen go out on a shift they ususally meet to divide their teams over the area they are serving. The teams take the crime prediction for that shift which is calculated by the computer model on the basis of whatever data is available up to shift. According to expected spots of crimes they especially assign teams to monitor those areas more closely. After introducing this method in the police work in Santa Cruz (California) police observed a significant reduction of 27% in crime. Of course this is a wonderful success story. Another success story involves the career development of the students and postdocs who now have permanent positions. Since this was the first group in the US to bring mathematics to police work this opened a lot of doors for young people involved. Another interesting topic in the context of Mathematics and crime are gang crime data. As for the the crime prediction model the attack of one gang on a rival gang usually triggers another event soon afterwards. A well chosen group of undergraduates already is mathematically educated enough to study the temporary distribution of gang related crime in LA with 30 street gangs and a complex net of enemies. We are speaking about hundreds of crimes in one year related to the activity of gangs. The mathematical tool which proved to be useful was a maximum likelihood penalization model again for the Hawkes process applied on the expected retaliatory behaviour. A more complex problem, which was treated in a PhD-thesis, is to single out gangs which would be probably responsable for certain crimes. This means to solve the inverse problem: We know the time and the crime and want to find out who did it. The result was published in Inverse Problems 2011. The tool was a variational model with an energy which is related to the data. The missing information is guessed and then put into the energy . In finding the best guess related to the chosen energy model a probable candidate for the crime is found. For a small number of unsolved crimes one can just go through all possible combinations. For hundreds or even several hundreds of unsolved crimes - all combinations cannot be handled. We make it easier by increasing the number of choices and formulate a continuous instead of the discrete problem, for which the optimization works with a standard gradient descent algorithm. A third topic and a third tool is Compressed sensing. It looks at sparsitiy in data like the probability distribution for crime in different parts of the city. Usually the crime rate is high in certain areas of a city and very low in others. For these sharp changes one needs different methods since we have to allow for jumps. Here the total variation enters the model as the -norm of the gradient. It promotes sparsity of edges in the solution. Before coming up with this concept it was necessary to cross-validate quite a number of times, which is computational very expensive. So instead of in hours the result is obtained in a couple minutes now. When Andrea Bertozzi was a young child she spent a lot of Sundays in the Science museum in Boston and wanted to become a scientist when grown up. The only problem was, that she could not decide which science would be the best choice since she liked everything in the museum. Today she says having chosen applied mathematics indeed she can do all science since mathematics works as a connector between sciences and opens a lot of doors. M. Allenby, e.a. : A Point Process Model for Simulating Gang-on-Gang Violence, Project Report, 2010. G.O. Mohler e.a. : Randomized controlled field trials of predictive policing, J. Am. Stat. Assoc., 111(512), 1399-1411, 2015. J. T. Woodworth e.a. : Nonlocal Crime Density Estimation Incorporating Housing Information, Phil. Trans. Roy. Soc. A, 372(2028), 20130403, 2014. J. Zipkin, M. B. Short & A. L. Bertozzi: Cops on the dots in a mathematical model of urban crime and police response, Discrete and Continuous Dynamical Systems B, 19(5), pp. 1479-1506, 2014. H. Hu e.a. : A Method Based on Total Variation for Network Modularity Optimization using the MBO Scheme, SIAM J. Appl. Math., 73(6), pp. 2224-2246, 2013. L.M. Smith e.a. : Adaptation of an Ecological Territorial Model to Street Gang Spatial Patterns in Los Angeles Discrete and Continuous Dynamical Systems A, 32(9), pp. 3223 - 3244, 2012. 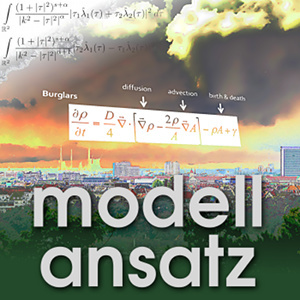 G. Mohler e.a.. (2011): Self- exciting point process modeling of crime, Journal of the American Statistical Association, 106(493):100–108, 2011. A. Stomakhin, M. Short, and A. Bertozzi: Reconstruction of missing data in social networks based on temporal patterns of interactions. Inverse Problems, 27, 2011. N. Rodriguez & A. Bertozzi: Local Existence and Uniqueness of Solutions to a PDE model for Criminal Behavior , M3AS, special issue on Mathematics and Complexity in Human and Life Sciences, Vol. 20, Issue supp01, pp. 1425-1457, 2010.